For example, the totality of our knowledge and experience with high school was limited to Archie Comics leavened with an episode of “Dobie Gillis” on TV. Nevertheless, attendance at East Anchorage High School would have been a fate worse than death for me, my buddies or any of the other students at Woodland Park Elementary School in the early-mid 1960s. Everyone knew that East was a windowless quasi-prison styled after an inverted coffee cup and that the students also had to attend class on Saturday. We were slated to attend West Anchorage High school – the Harvard of the north. Green Bay Packers vs.…. (OK skip that one- Green Bay was the only NFL team we knew about). It even extended to airlines, which may seem odd for our age group – but completely logical when given our neighborhood’s proximity to Anchorage International Airport and Alaska’s incredibly high rate of aviation-related activity. In those regulated days of air travel there were actually a lot more airlines and many of the major players passed through Anchorage enroute to the Orient or over the North Pole to Europe. Because they serviced such far away destinations the big guys like Northwest or Western didn’t hold our interest quite as much as the small regional airlines did. London was a mythical place where John Steed and Emma Peel fought cybernauts but Palmer was a town that I had actually visited once, so it was real and the smaller planes that went there were easier to understand than big jets. Cordova operated twin engine Douglas DC3s while PNA flew four engine Lockheed Constellations. Cordova flew into Soldotna and Kenai while PNA serviced only Kenai. During World War II DC3s flew as the cargo / paratroop carrying C47 Skytrain (US) Dakota (UK) while the Constellation did some light lifting stateside. DC3s looked like bulldogs ramming their way through the air while the Constellation’ dolphin-like lines caused it to more gracefully sail the skies (I had to concede that one to Mark….). Cordova Airlines flight crews just looked so much more butch than the PNA guys did. The debate took a practical turn over Christmas vacation 1965. Most childhood friendships fade away when kids move, but circumstances conspired to keep Mark and I in touch after my family moved down to the Kenai Peninsula southwest of Anchorage a year earlier. One such circumstance was a medical specialist’s appointment my mom had scheduled at Elemendorf Air Force. We were in the middle of a unseasonably warm storm known as a chinook that made highway travel extremely dicey so mom was going to make the trip by air …and with tickets only $7.00 a trip she could easily afford to take me along with her. I jumped at the chance – it was a visit with my best friend, I loved to fly and with Christmas Day itself already over there was little to do but squabble with my sisters. We took an early morning flight out of Soldotna City Airport, flying out on a Cordova Airlines DC 3. I was so entranced by the orange, magenta and pink hues of an Alaskan mid-winter sunrise that I didn’t mind a bit of turbulence left over from the chinook and when the colors no longer kept my attention I started blasting Messerschimtts out of the sky with a mock machine gun I had cobbled together out of a fountain pen, a large spring-type binder clip and length of 10 gauge copper wire that I picked up from who knows where. It was a wonderful dreamlike flight. It was the trip back that got scary. Who would be the better German Luftwaffe pilot (Mark did a great German accent while I was the proud possessor of a Teutonic surname). …and which airline had the better safety record: Pacific Northwest or Cordova. The details of that last debate came to mind quite forcefully as our visit ended and I rode with Mom out to the airport, checked in and boarded a Cordova Airlines DC3. We would be flying home at night which wasn’t nearly as pretty as a day flight – and from the wind picking up it looked like it would be a lot more turbulent as well. As I was buckling my seatbelt the pilot walked past – his face looked like it had been chipped out of granite, making wonder if he’d flown a plane like this during Normandy jumps Mark and I had argued about during the visit. When we took off and the DC3 started to porpoise up and down as the landing gear clunked up I began to pray that he was as experienced as he looked. It was going to be a wild ride. South-central Alaska looked a lot different from the air fifty years ago than it does now – a lot more empty. Anchorage was about a quarter of its present size, and the Kenai Peninsula was even more sparsely populated. When you fly the route these days the dazzling glare of the Anchorage area at night keeps you illuminated as move southwest crossing Turnagain arm – and then it’s only 10 minutes or so before you’re over yard lights which slowly transition into the lit-up minimarts, schools and streetlights of more populated areas like Kenai or Soldotna proper. We took off and flew into darkness. There were some tiny points of light but they were few and far between. Occasionally there would be a bright flare on the horizon when natural gas would vent during operations at the Swanson River oilfield or related oil-industry sites on Cook Inlet. There would be occasional points of light which were most likely small dings and scratches on the Plexiglas window next to my seat. Then the serious turbulence rolling off the mountains hit us and it got very scary as the DC3 started rocking and a-rolling with a vengeance. As we neared the oil fields those natural gas flares got a little more personal and the view out of the window took on aspects of something between Mordor or Germany during the World War that had just barely ended twenty years earlier. That started me wondering again if any of our flight crew had flown a DC3 under WW2 and when that thought came to mind I could relax a bit. I gripped the armrest and closed my eyes, only to snap them back open at Mom’s comment to a cabin-mate that I might be scared. My twelve-year old ego goaded me into trying to sound nonchalant as we talked but the onset of puberty robbed me of even that little shred of dignity. Then Mom stopped in mid-sentence, pointed up and out of our window and said “Look – it’s the Big K greenhouse” – I looked out at total darkness, and then glanced almost straight down to see the brilliantly lit facility directly below us and replied ”I’m looking, I’m looking!” In those brief seconds between Mom’s comment and my response the plane had banked/rolled more than 60 degrees! …and blessedly at that moment the drone of the engines changed and I knew we were almost there. Before we knew it the plane was making its final approach and landing at Soldotna Airport and we were on solid ground again. Ever the comedian I made a big show of hugging and kissing the ground after we deplaned but to be honest there are few times when I have ever been so thankful to be on the ground again – and especially so close to home and my own bed. Weather conditions had gotten so bad that the balance of the trip to Homer had to be cancelled for the night – and PNA hadn’t flown at all that evening! We were home and safe. This entry was posted in 1965, Alaska, Aviation by David R. Deitrick. Bookmark the permalink. Rerun Saturday for the 17th of November. Those old DCs were brilliant ‘planes, weren’t they? I have nothing to compare with that – my most nerve-wracking flight was a London-Edinburgh Trident that was forced to fly around a thunderstorm. It took 90 minutes instead of the usual fifty and we were banked to about 30% all the way! I remember the sweat on the pilot’s shirt as he saw us off at the end – they did that in those days. I think he got a few more handshakes than usual. 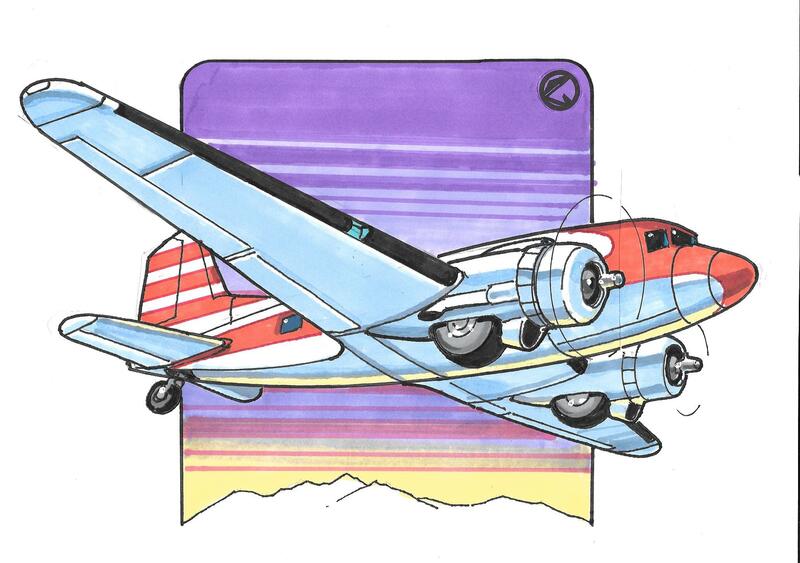 Frederick – I think the only contemporary A/C anywhere close to the capability of a DC3/C47 is the C130 Hercules. While I was in the Army I took more than one C130 flight just as rocky as the one I wrote about here…and while writing this it occurred to me that we’re talking about technology almost as as that of the DC3! If ever an aircraft could be awarded a DFC the C130 would have to be right up there. Modern A/C seem completely sterile and soulless to me – technology that could be miraculous encased in huge plastic cattle wagons. There’s no adventure anymore!